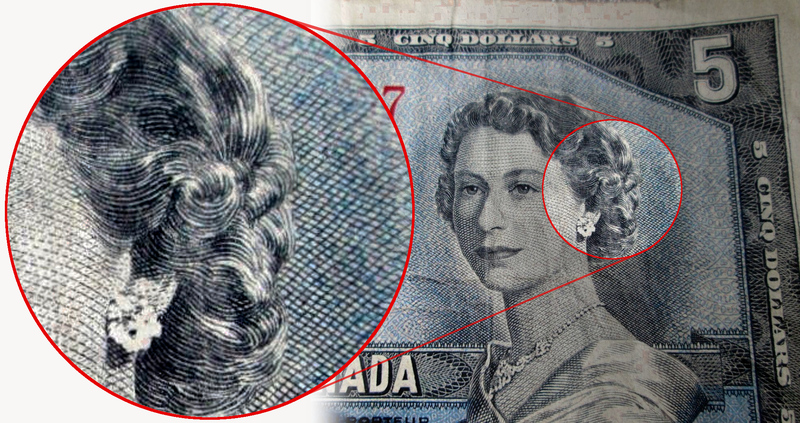 Of the many photos I took of a 1954 Canadian dollar bill in 2015—what with laptop and backup failures—this closeup of (the wrong part of) Queen Elizabeth II is all I have left. The 1954 Canadian dollar bill was issued as part of the Canadian Landscape series of bank notes and replaced a series dating back to 1937 which carried the portrait of of the British monarch, King George VI. And the year before, on November 8, 1951, there had been a speech by Canadian Prime Minister Louis St-Laurent to the House of Commons declaring that it was his government’s policy to replace the word “dominion” with the word “Canada. 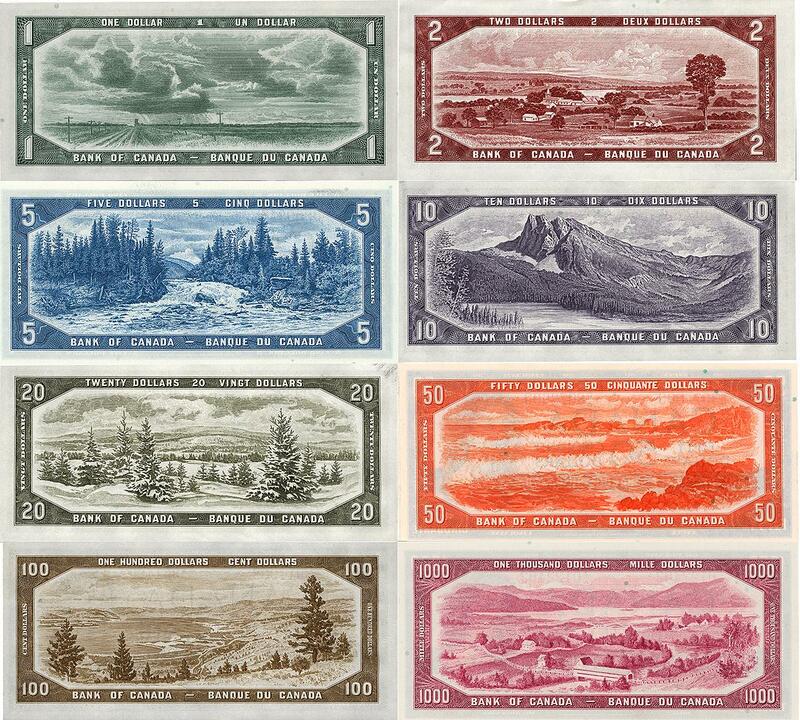 It was decided that the reverse of each bank note would feature a different Canadian landscape; all of them suitably mythic and unspoiled by human activity. Over 3,000 images were considered and the eight which where chosen became known collectively as The Great Lone Land vision of Canada. This was in reference, apparently to The Great Lone Land, a North American travel narrative written in 1872 by William Francis Butler. Having already extolled the beauty of the 1974 dollar bill in 2014, it seemed only fair to write a companion post on its predecessor—for the sake of thoroughness, if nothing else and especially since the opportunity for original photographs had fallen into my lap. Four years later I can only wonder what the devil I was thinking. Click the images to enlarge them. Oh, in case you’re wondering, other notable deviltry of 1954 included the films Beat the Devil, Devil Girl from Mars and Devil on Horseback; various Looney Tunes cartoons, including Devil May Hare and Devil’s In The Details. There were the songs Up Jumped the Devil, by Roy Brown and Old Devil Moon (recorded three times), by Miles Davis, Frank Sinatra and J. J. Johnson; the Japanese manga The Devil of the Earth, by Osamu Tezuka; the play, The Devil A Saint Would Be; the books The Devil’s Hunting-Grounds. by Walter Roberts and When the Devil Holds the Candle, by Karin Fossum, plus the science fiction short story Rastignac The Devil by Philip Jose Farmer. I fondly recall that series of banknote. We were told if you folded the note just so, you could see the queens bum! I tried it more than once but was not strongly convinced that there was a resemblance. I never heard the Devil story before. Great Saturday morning read, Stanley. I think someone gave you a bum steer Sharon but I will definitely look into it! Interesting for sure. And your reference to some tech malfunction reminded me to ask about not being able to print out your posts anymore. Some are such gems I enjoyed having a copy to show people. Thanks for bringing this to my attention. Without a printer I’m unable to test print from the blog, in fact I’ve never considered the issue but now I will and get back to you with any info I come up with. Off topic, sorry BUT, March 18 is Transit Driver Appreciation Day! Transitdriverday.org (I don’t have social media) Pass it on. Consider it done. Your wish is my command.